November 23, 2015 – Muncie, IN – Muncie Innovation Connector recently hosted the Excellence in Innovation Awards at the Horizon Convention Center. The purpose of this inaugural event was to recognize leaders in business innovation including those who are well established and others who are emerging. Ted Baker, Executive Director of the Innovation Connector, served as the evening’s emcee. Keynote speakers for the evening were Ontario Systems co-founders, Wil Davis and Ron Fauquher. The duo recounted the challenges they faced and the lessons they learned as they launched their software company, literally out of a garage. They also challenged the crowd of more than three hundred in attendance to learn from every experience, take the time to hire the right people, be committed to developing your staff, create a sustainable organization, understand your corporate and individual purpose, and always innovate. Awards were presented in three categories throughout the evening. Attendees celebrated five business owners and organizations with the Excellence in Innovation Award. These businesses have survived many challenges over the years to remain solid anchors for the business community in East Central Indiana. Also accepting an award was local high school student who was presented with the first ever Young Innovator’s Award. Lastly, the Innovation Connector awarded five emerging businesses with the top prizes in the 2015 Big Idea Pitch Competition. 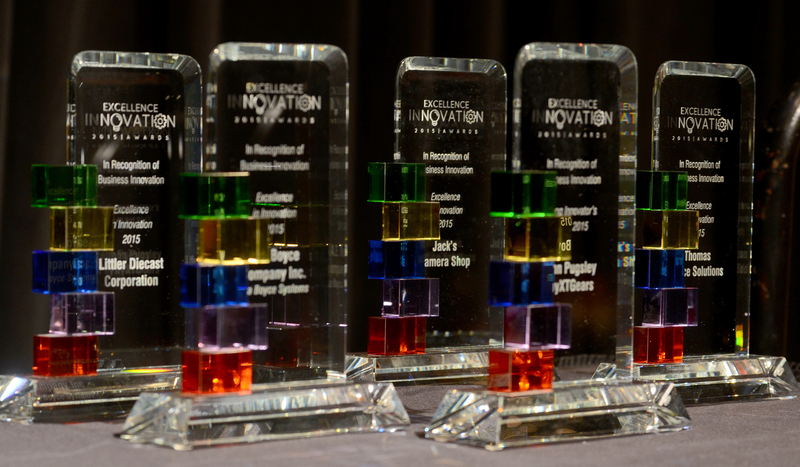 These five recipients were honored as inaugural Excellence in Innovation Award Winners and inductees into the Innovation Connector’s “Innovation Wall of Fame”. The Young Innovator Award was presented to John Pugsley from Daleville High School. In the spirit of innovation, the five finalists of The 2015 BIG Idea Pitch competition delivered their business ideas in live; two-minute pitches to all in attendance. A panel of distinguished judges then awarded the following winners later in the evening. Big Idea Pitch winners walked away with prize packages totaling nearly $40,000 in cash and services. The 2015 BIG Idea Pitch and the Excellence in Innovation Awards were presented by the Innovation Connector and sponsored in part by First Merchants Bank, Ball State University, Ball Brothers Foundation, Indiana Michigan Power, MutualBank, Whitinger & Company, Star Bank, Ontario Systems, Whitinger Strategic Services, Ivy Tech Community College, IU Health Ball Memorial Hospital, LEAP Managed IT, and Defur Voran.